Looking for a comfortable, durable or pregnant friendly air mattress, choose Sleep Number Bed. A distinctive quality of this bed is that it allows its users to adjust the firmness of their bed according to their individual needs and requirements. The innovative concept of Sleep Number beds makes them unique in the mattress industry. Learn more about these adjustable air mattresses in the Sleep Number Bed Review listed below. Sleep Number beds basically use air and not springs or foam for primary support. While the mattress may look similar like any other foam mattress, the difference is that they feature separate air chambers underneath on both sides. Using a remote control, the user can decrease or increase the sleep number’ and adjust the firmness of the bed on each side. It must be noted that each side of the bed is equipped with its own setting. The process basically helps decrease air pressure inside the air chamber using an electric pump to make the mattress softer or increase to make it firmer. · Classic Series: With queens priced as low as $1000, this series is one of the cheapest options available in Sleep Number beds. Featuring a low height matters (8-9 inches) the classic series allow you enjoy the comfort of the unique technology without burning a hole in your pocket. · Performance Series: Featuring a thicker mattress, the beds in this series are usually associated with more comfort. With a five zone comfort layer that helps confirm to the different parts of your body, this series with a pillow top design start at$2,100 only. · Memory Foam Series: With the price starting at $2,800, a distinctive feature of the memory foam series is that it uses gel technology that helps keep the sleeping surface cool. 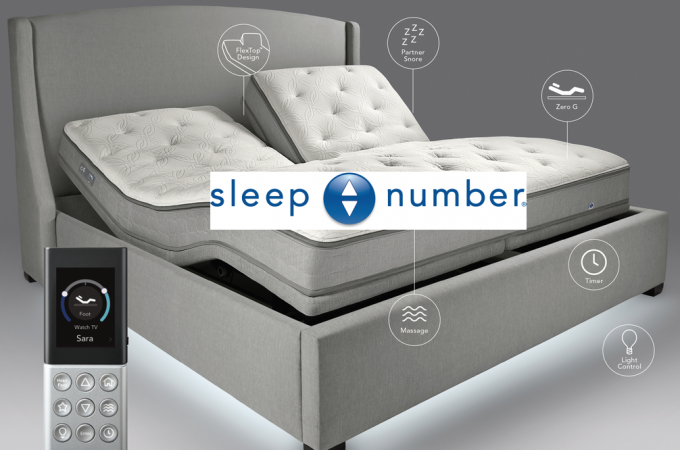 · Innovation Series: Featuring the costliest Sleep Number beds, the innovation series have special features that are absent in the other series. The price of beds available in this series starts at $3,000. Equipped with the unique feature of instant adjustable firmness, this bed allows the user to regulate the firmness of his bed according to their individual needs and requirements. While reducing firmness helps people suffering from back pain or other similar problems to sleep comfortably on the bed, people with neck or back problems find their bed more comfortable after setting its firmness high. Sleeping on a Sleep Number bed not only cushions your body to support your spine and back more properly, but also helps decrease uncomfortable pressure points. As a result, owners sleep more soundly with less turning, tossing and restlessness. Nearly 20 percent of the owners experienced reduced pain after using this bed. However, while sleeping on the bed helped ease pain that one experienced both in and out of the bed, most owners’s experienced great relief from back pain. Two people sleeping on the same bed can sometimes have different preference regarding the firmness of the bed. Sleeping on Sleep Number bed allows them to adjust the firmness on their side according their personal requirements, allowing two people with different firmness necessities to sleep comfortably on one bed. Sleep Number Beds are constructed by combining different parts. As a result, if there is any problem with the mattress, all you need to do is to change the part and keep the overall unit maintained. Unlike coil mattresses where you are usually required to change the whole mattress if something goes wrong, changing just a single part in Sleep Number beds makes the bed last much longer. Another factor that makes these beds durable is the fact that these beds use air to support the sleeper. Unlike foam or spring, air does not breakdown or compress with time or daily wear and tear. Equipped with the sleep IQ technology, Sleep Number beds have sensors that help measure your breathing rate, heart rate, and movement while you sleep. As a result, it not only helps the owner learn more about his sleep, but also gives you advice on the possible changes you can make in your day to day routine or sleep number. Sleep Number beds are a great choice for pregnant women. The good support that they provide coupled with the adjustable firmness makes them a favorite choice among women who are pregnant. Sleep Number mattresses usually weigh between 37- 120 pounds depending on their size and model. The fact that these beds are modular and relatively light weight; it makes it easy for the owner to lift, move, handle or transport them effortlessly. · People who are looking for beds that are easy to maintain as well as durable. · People who wish to buy quality mattresses and are willing to pay the price for a quality product. · For those who require different firmness requirements from day to night. These beds come with a 25 year limited warranty period. However, while Sleep Number will repair or fix anything for free in the first two years, the warranty becomes prorated after this period of time. As a result, the owner will be responsible for the repair costs for each year that passes. If you one of those people who wish to own a Sleep Number bed, but cannot afford one, take a look as the financing options provided by the company. To avail this benefit, all you need to do is to fill in some of your financial information and submit it to receive credit decisions. Opting for financing option can make these beds more affordable to you. The return policy of Sleep Number allows its customer to take a 100-day trial period. If you are not satisfied, you can return the bed for a 100% refund or an exchange. However, it must be noted that customers are expected to pay the shipping charges required to send the product back to Sleep Number.